I have been sponsored by PPG Timeless to write this post, but all opinions expressed are my own. I’m so excited about today’s post because after years of slowly remodeling my dining room, I am finally finished! We are thrilled with how pretty the space turned out and if you’re wondering why it took me years to finish this room, this is the one room in my home that I just wasn’t feeling inspired. So instead of forcing myself to do something in this space that was just “ok”, we did a few little things along the way until we were inspired to finish it. So I mentioned a couple weeks ago that I teamed up with PPG on two paint projects to try out their new PPG Timeless paint. 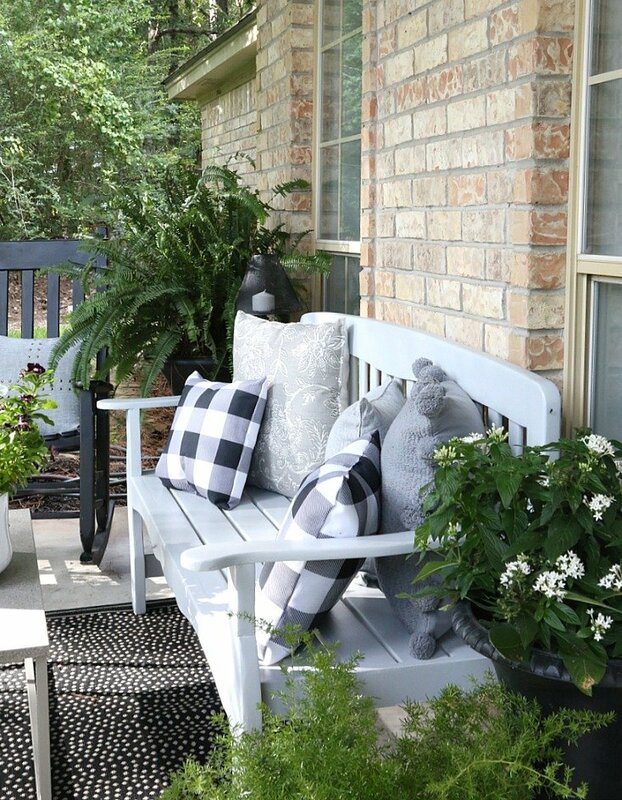 The first project was my porch bench that I shared here using the new PPG Timeless Exterior paint. 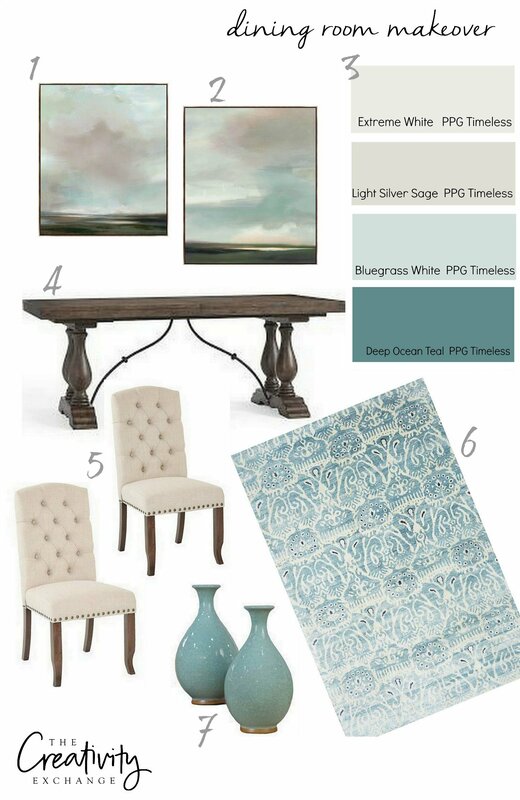 The second project that I decided to do was to paint my dining room using the new PPG Timeless Interior paint. 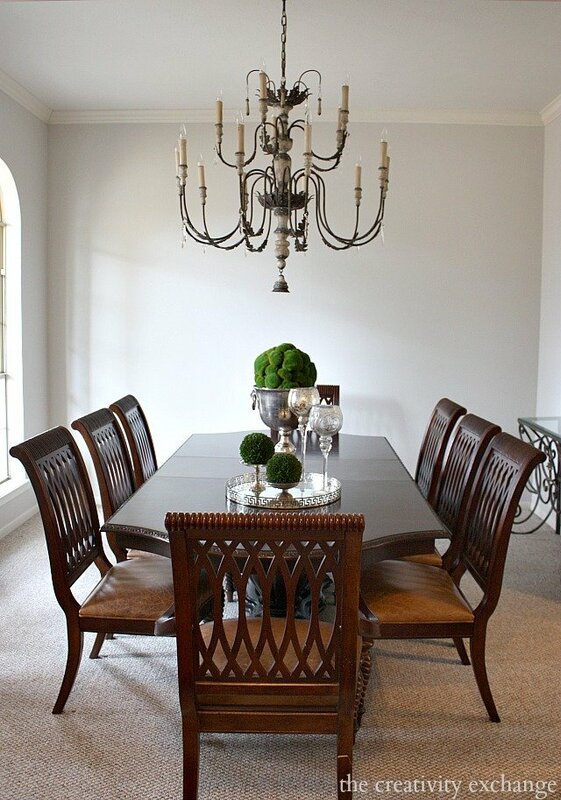 After seeing the beautiful PPG Timeless paint colors, I was inspired to finally finish my dining room remodel project. Just look at these gorgeous colors! 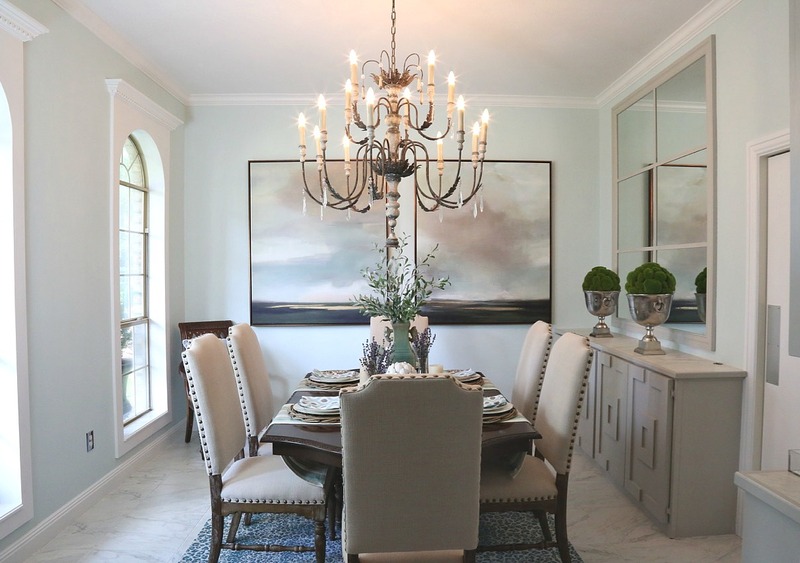 Before I show you the final reveal of our project, you need to see the before picture of our dining room. I created a design board to show you how our plan came together. You’ll see that most of the items on my design board are not exact but are very similar to what I used. 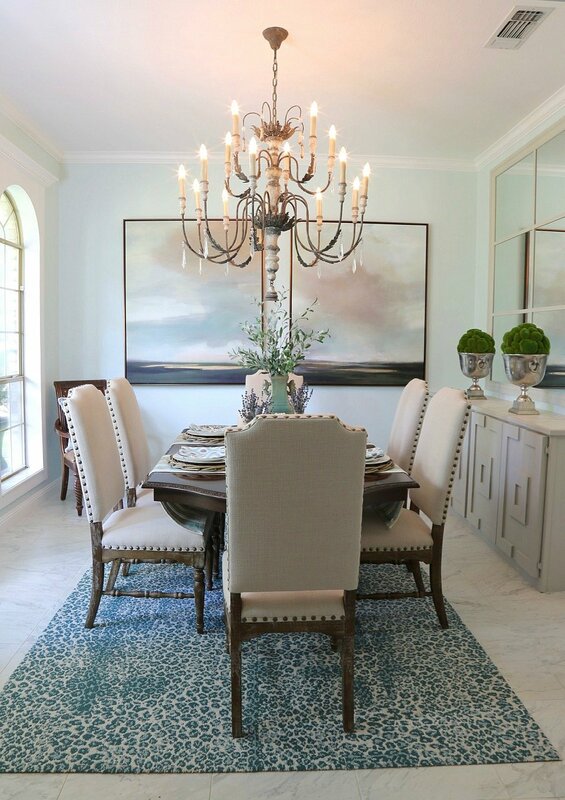 We have had our table, rug and accessories for years and they are no longer on the market. At the end of the post, I have links to everything in the design board. 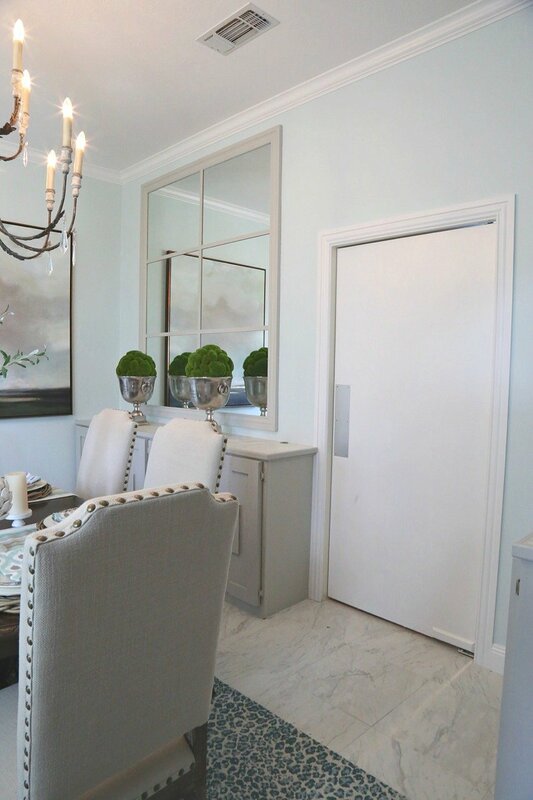 The PPG Timeless paint color we picked is called Bluegrass White and it was exactly the color that I had envisioned for pulling this space together. 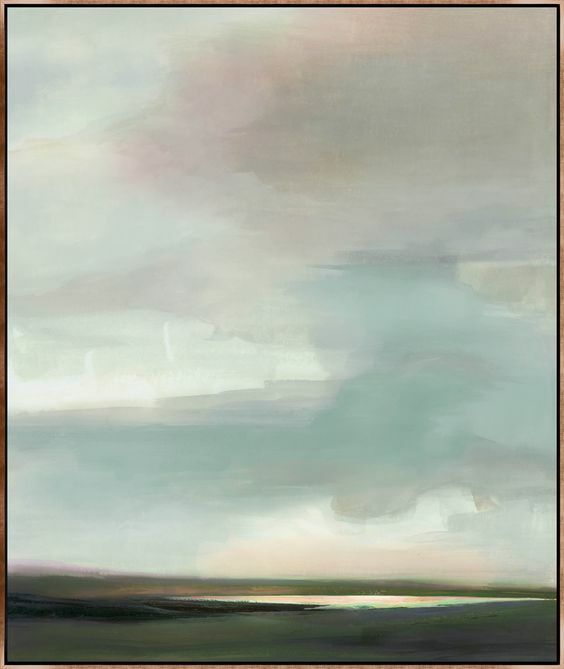 A perfect light blue/green/gray serene color. 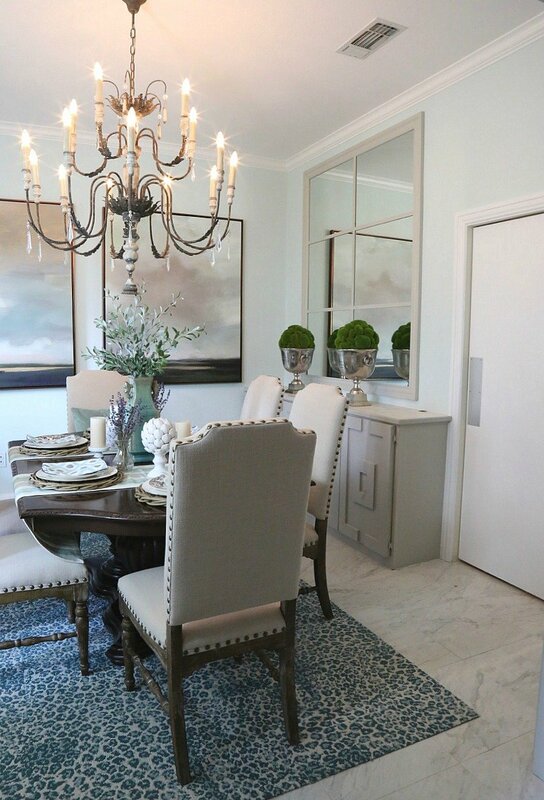 Bluegrass White is a very subtle color that looks so amazing on our wall. Here are some better shots where you can really see just how pretty this color is and how gorgeous the PPG Timeless finish is on the wall. By the way, I used a flat finish. 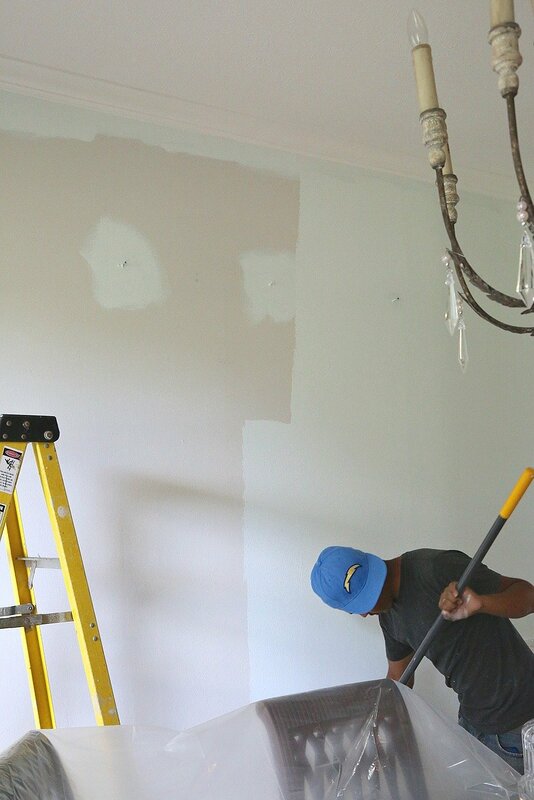 You can really get a feel for this color by looking where the wall meets the bright white on my ceiling and trim. A lot of you ask me about wanting to use a flat finish but worry about durability or smudges showing. I highly recommend using a more durable product with consistent coverage like PPG Timeless paint if you’re looking for a beautiful flat finish! You can also really see below just how consistent and even the PPG Timeless flat finish is. I have been so blown away by this new PPG Timeless paint because it’s a one-coat coverage in 1,000 colors, paint + primer all-in-one. I have used dual paint + primer products in the past but often times, multiple coats were still needed. 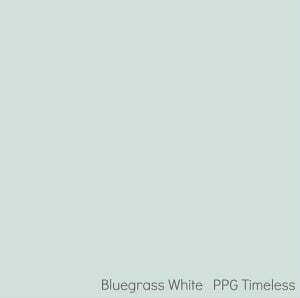 Now that I have tried both the exterior and interior line of the PPG Timeless, I am THRILLED that that a paint company has finally created something so awesome that actually does cover in one coat, with a very rich and consistent pigmentation. 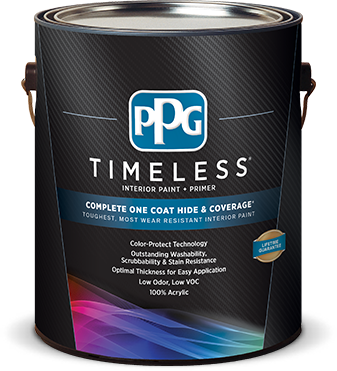 The other great thing about the new PPG Timeless paint is that it’s one of the most durable paints on the market. I mentioned a couple weeks ago in my bench makeover post that PPG creates the paints/coatings for submarines, aircrafts and even the space shuttle. 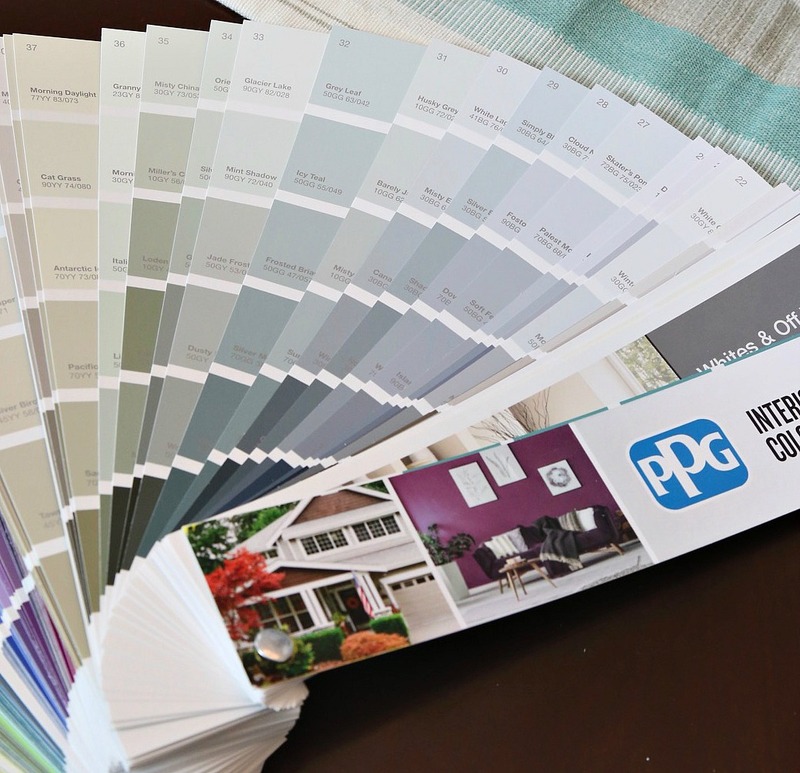 It was only a matter of time that the same company that creates paints that will withstand re-entry into Earth’s atmosphere, would set out to create the world’s most durable and beautiful interior/exterior consumer paint using some of the same leading PPG technology and innovation found in their commercial paints/coatings. Can you tell I’m a little excited about this awesome paint? I can’t wait for you guys to try it! You can get it now at Home Depot. 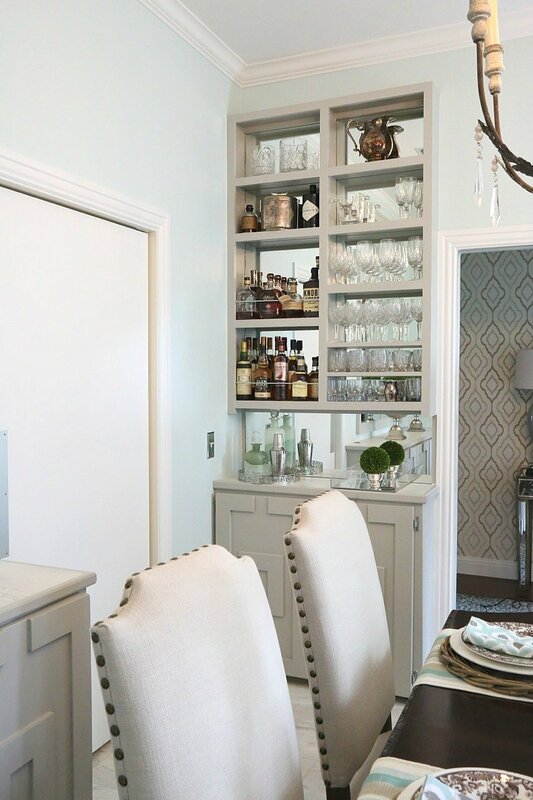 As far as everything else in our dining room makeover, a couple years ago, we built the buffet and bar. I shared our tutorial for building the buffet here and the bar here. Those two projects were the start of remodeling our dining room. I decided to get rid of our dining room chairs and update the space with linen upholstered chairs. These were our old chairs that we bought about 15 years ago along with the Bernhardt dining table. 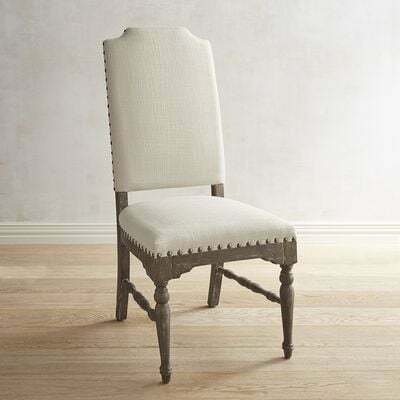 I wanted an upholstered chair that I could eventually have covered in a beautiful fabric. For now, I’m just sticking with the pretty linen with nail heads. 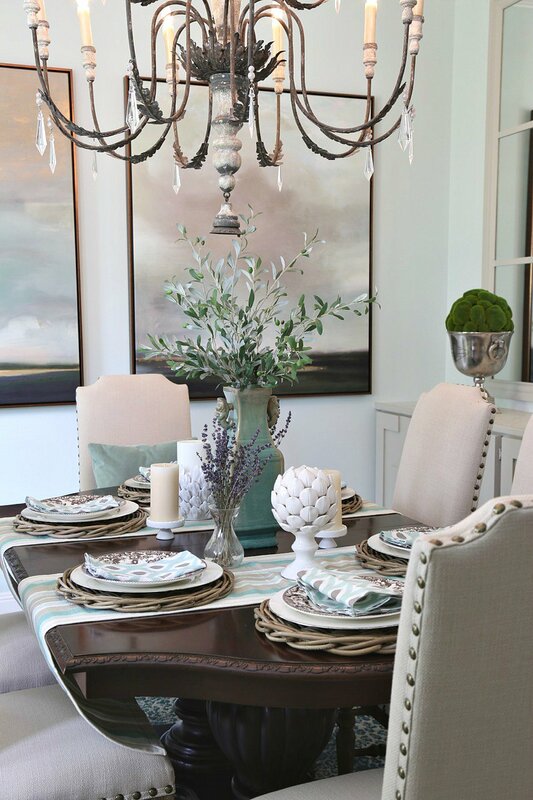 Switching out dated chairs is a great way to update a dining table. I recently bought the chairs at Pier One and we love them! 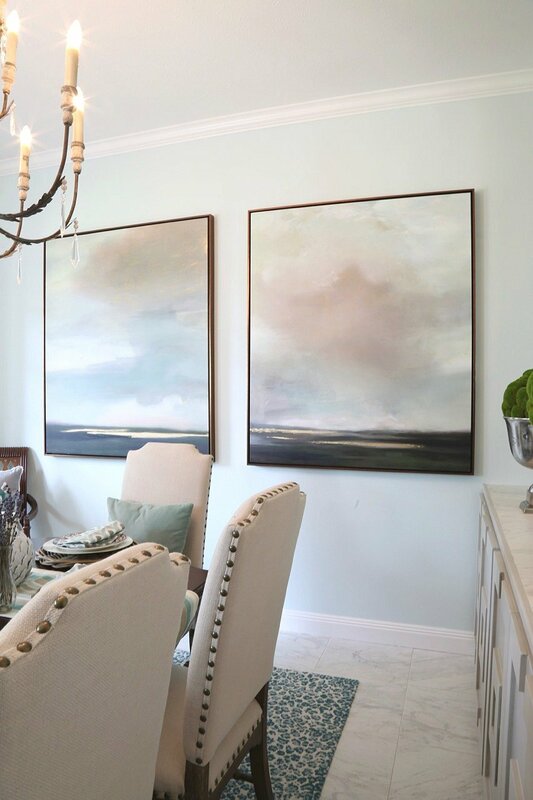 I have had a love affair for years with these two paintings from High Fashion Home and I knew that they would be perfect in our dining room. 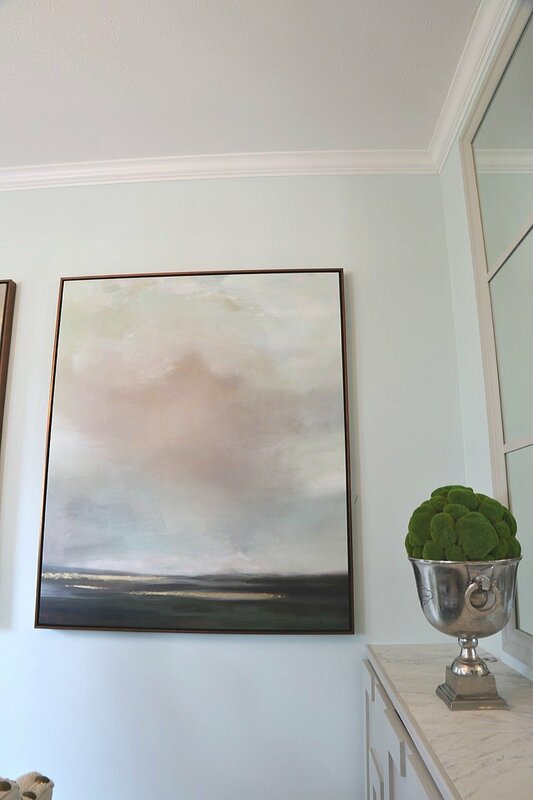 After we hung them, the room really started to come together and I knew I wanted to pull out that light blue/green/gray color in the paintings for the wall. We also removed the carpet in the dining room and installed a marble-alternative porcelain tile that looks just like marble! We LOVE it! I’ll be sharing more on the tile project in the next couple of weeks. Of course, it’s always fun to layer a table. 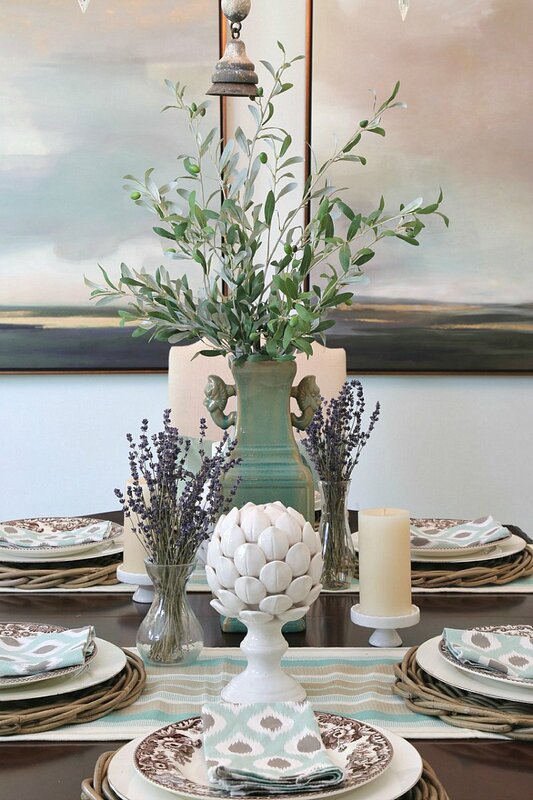 I mixed in faux olive branches and dried lavender to transition into fall. Here are links to all of the products in my design board. You’ll find the links under the board. I cannot tell you just how happy I am that this room is finally finished! A HUGE thank you to PPG Timeless for inspiring me with such beautiful colors and paint to create a space that we absolutely love! It’s beautiful! 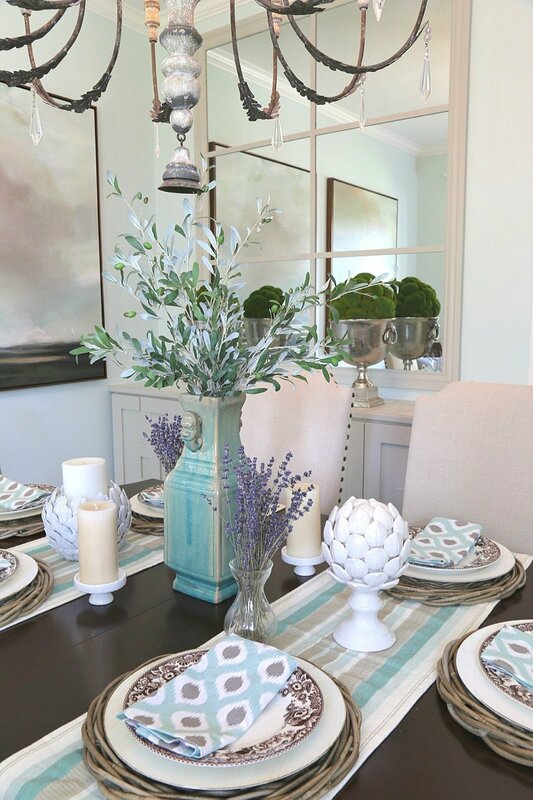 Love the paint color, the new chairs, flooring, the light fixture and all the accessories. Nicely done! Lovely! I wish Flor still offered the turquoise leopard print carpet. I’m new to your site….. Love it! May I ask where you found the mirror? Love how your room turned out. Your bar makeover was why I originally started following your blog. The room turned out beautifully. 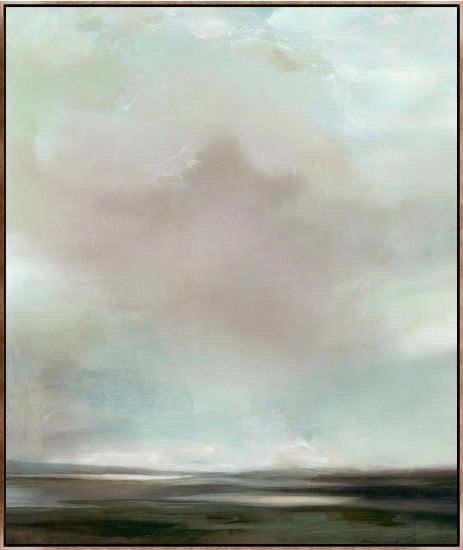 I love the soft, calming color. I can’t wait to try this paint. Thanks for sharing. How have I not discovered you before?!? 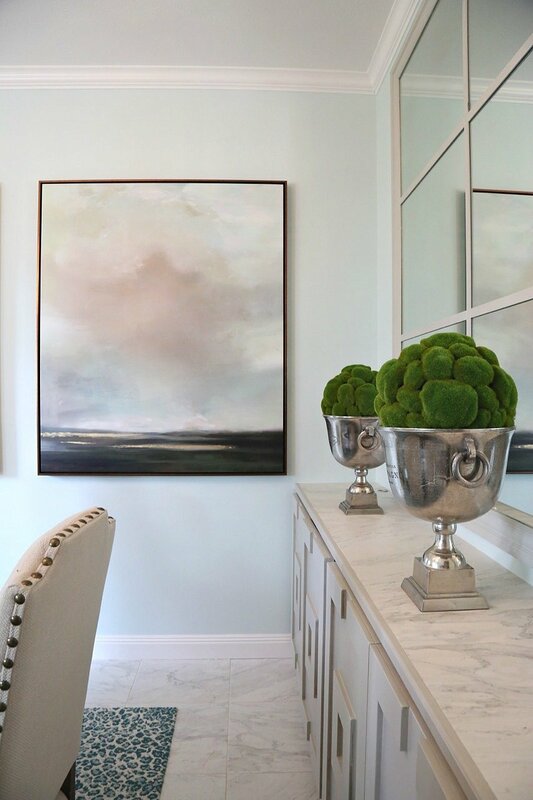 Love this room and the grayed Aqua of your walls is perfect. 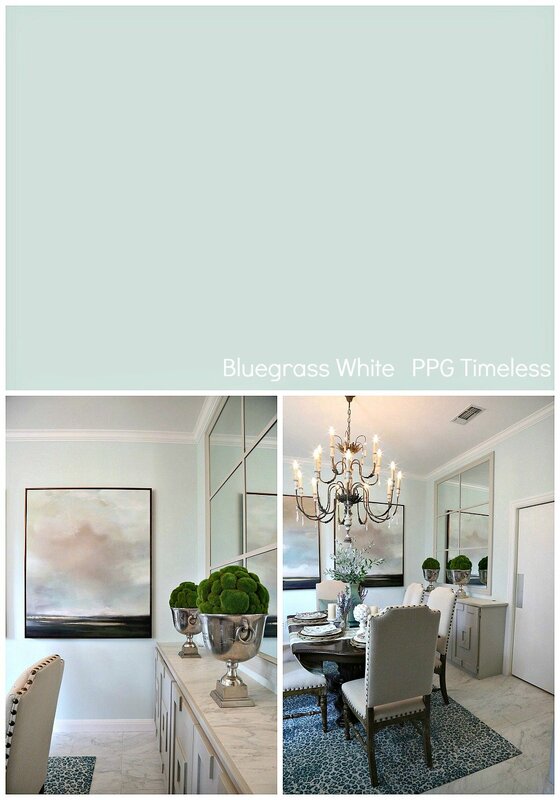 I see why you’re in love with this PPG Timeless color. Now off to see how you built that bar!